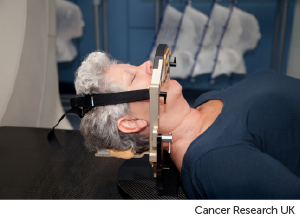 Stereotactic radiotherapy is a way of targeting radiotherapy very precisely at your tumour. This type of treatment is not available at all hospitals because it needs specialist equipment and skills. You have the treatment with a linear accelerator (LINAC). This is the same type of radiotherapy machine used for regular external beam radiotherapy. Stereotactic radiotherapy treatment is usually divided into daily doses called fractions. The number of fractions can vary from between 3 to 30 fractions, depending on a person's situation. Radiosurgery is a type of stereotactive radiotherapy. It involves very high dose stereotactic radiotherapy as a single fraction, or up to 5 fractions. In general, stereotactic radiotherapy and radiosurgery is used to treat smaller lesions (ideally less than 3cm). Your treatment team attach a frame to your skull using 4 pins. Before they attach the frame, you have 4 injections of local anaesthetic at the points where the frame is attached to your head. This takes about 10 minutes. As the the frame is fitted, you feel some pressure and tightness, but it usually feels better within a few minutes. Another way is to have a mask made from plastic. It is called a thermoplastic mask. The frame fixes to the mask. 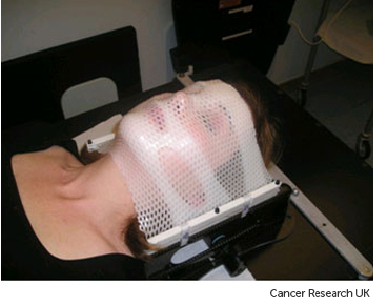 The mask in turn attaches to the scanner or radiotherapy machine bed while you are wearing it. This means that you can't move, but there is nothing actually attached to you directly. Stereotactic radiotherapy planning is similar to having planning for normal external radiotherapy. During planning, your specialist uses the scans to work out how to shape the radiotherapy beam, so that it exactly fits your tumour. This means that the normal brain tissue surrounding the tumour gets a very low dose of radiation. Therefore you have fewer side effects than you would have with conventional external beam radiotherapy. You have your treatment in the radiotherapy department of the hospital. It takes a little while for the radiographer to fit the mask or head frame, and position you on the radiotherapy table. But the treatment itself doesn't take too long. You can go home as soon as each treatment is over. Stereotactic radiotherapy has fewer side effects than the usual type of external beam radiotherapy. This is because the area being treated is smaller and so less healthy brain tissue is exposed to radiation. With stereotactic radiotherapy your are less likely to have hair loss, feel sick, or have reddening of the skin. But you might feel very tired for a while afterwards.